Several permanent icons appear on the Desktop after Active@ LiveCD start up. To see a "hover box" with additional information about a quick launch icon, hold your mouse pointer over the icon. Note: To add more shortcuts to the Desktop, configure existing or remove undesired ones, invoke a context menu (right mouse click) for the Desktop and execute related commands. Configure Desktop — menu item is accessible from Application & Computer menus. 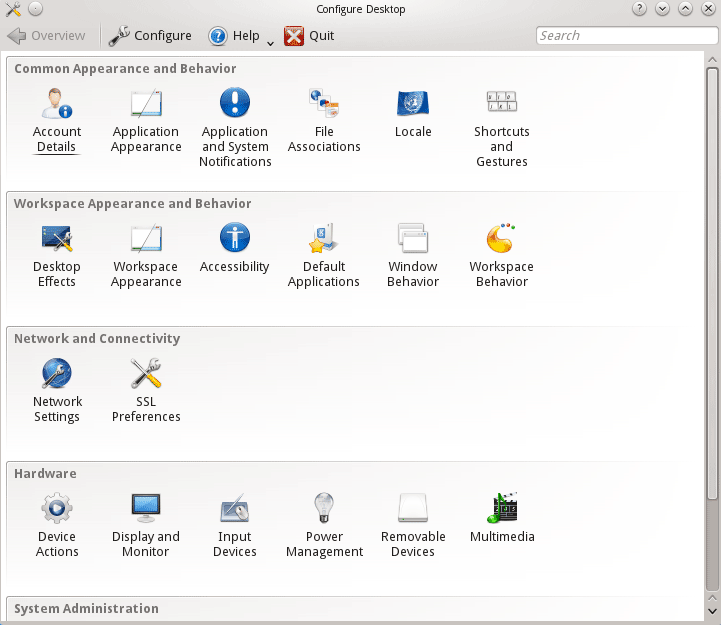 Desktop configuration is same as Control Panel. System Information Panel has been displayed on the right side of the screen. It monitors current status of the system - displays CPU & RAM usage, Disks & Network activity, Hardware Temperature and much more. This information can be very useful system is damaged and data needs to be recovered (for example if motherboard or HDD is too hot). You can remove unnecessary applets, or the whole panel. On the right side of the taskbar is a system tray with a clock showing the system time. Hovering your mouse over the clock will show you the current date and your time zone. As well, several icons provide quick access to system utilities. To see a "hover box" with additional information about a system utility icon, hold the mouse pointer over one of the icons. If a network is installed and activated, click on the Network Interface displays full configuration details such as operational status, IP address, DNS server address, firewall status, and so on. The icon that is placed all the way to the right (Panel Tool Box) allows to customize task bar & quick launch icons: adding more applets & widgets, removing existing ones, taskbar height change and so on. Note! If you run Active@ LiveCD from USB disk, all customizations to the Desktop, Time Zone, Application Icons, Task Bar & Quick Launch icons will be stored to USB permanently and restored the next time you launch Active@ LiveCD.